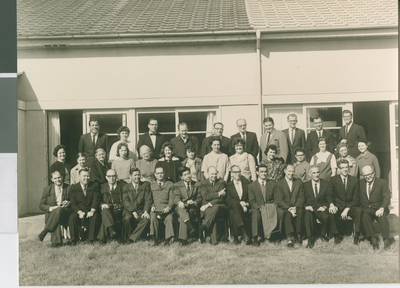 "1965 Asian Mission Workshop, Ibaraki, Japan, 1965"
A group of American missionaries to Asia from a cappella Churches of Christ attend a conference in Ibaraki, Japan to fellowship, discuss strategy, and share resources. The picture was taken in front of the Home Economics building. Back row left to right: Bob Davidson, Ruth Betts, Bob Buchanan, Charlie Davis, Unknown, E. W. McMillan, Dorsey Traw, Terry Giboney, Robert Yarborough, Ray Brown. Second row left to right: Unknown, Elizabeth McCaleb, Bess Wheeler Rhodes, Unknown, Mrs. E. W. McMillan, Joan Gurganus, Norma Doyle, Barbara Buchanan, Unknown, Edna Pendergrass, Dixie Yarborough, Susan Giboney, Unknown, Barbara Bixler. Front row left to right: L. T. Gurganus, Unknown, Unkown, Parker Henderson, Unkown, Akio Limb, Joe Betts, Unknown, Ken Rideout, Dean Bixler, Unknown, Pence Dacus, Unknown. photographic print, 15 x 20 cm.